by Weinbach, Robert W.; Grinnell, Richard M.
NOTE: This is the bound book only and does not include access to the Enhanced Pearson eText. To order the Enhanced Pearson eText packaged with a bound book, use ISBN: 0133909069. A reader-friendly approach to statistics in social work practice. 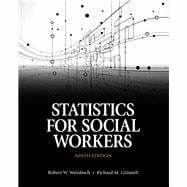 Statistics for Social Workers, 9/e familiarizes students with statistical tests and analyses that are most likely to be encountered by social work researchers and practitioners. This reader-friendly title emphasizes the conceptual underpinning of statistical analyses, keeping mathematics and complicated formulae to a minimum. Readers require no prior knowledge of statistics and only basic mathematical competence. Affordable. Experience the advantages of the Enhanced Pearson eText along with all the benefits of print for 40% to 50% less than a print bound book. Robert W. Weinbach, Ph.D., MSW, ACSW is Distinguished Professor Emeritus at the University of South Carolina, where he continues to teach graduate level research courses in the College of Social Work. He is also a co-author of Research Methods for Social Workers, seventh Edition; The Social Worker as Manager, Sixth Edition; and is the author of Evaluating Social Work Services and Programs, (all published by Allyn & Bacon), as well as over 75 other publications and invited book chapters. He earned graduate degrees in social work from SUNY-Buffalo and Ohio State University and has worked in both medical and psychiatric social work practice and as a program evaluator. Richard M. Grinnell, Jr. is a Professor of Social Work and holds the Clair and Clarice Platt Jones/Helen Frays Endowed Chair of Social Work Research in the School of Social Work at Western Michigan University. He received his Ph.D. in social work from the University of Wisconsin at Madison and for over the past 40 years has held academic and senior university administrative appointments in Australia, Canada, and the United States. He has published over 100 journal articles, book chapters, and conference presentations, and 36 books. His two latest books are Evaluation for Social Workers: Foundations of Evidence–Based Programs, 6th edition (Oxford University Press, 2012, with Peter Gabor and Yvonne Unrau) and Social Work Research and Evaluation: Foundations of Evidence-Based Practice, 10th edition (Oxford University Press, 2014, with Yvonne Unrau).